Take a magic carpet ride with Encore Studio as we present A Whole New World. We'll be One Jump Ahead sharing Unbelievable Sights and Indescribable Feelings! 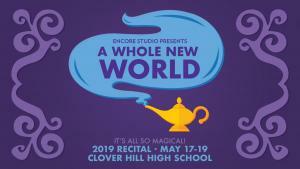 Join our Westchester and Chesterfield dancers at Clover Hill High School as we celebrate our 2019 Encore Recital! Please note the day and time of each show you are purchasing tickets for to ensure you have selected the correct cast.